The Rev. George R. Woodward, M.A. 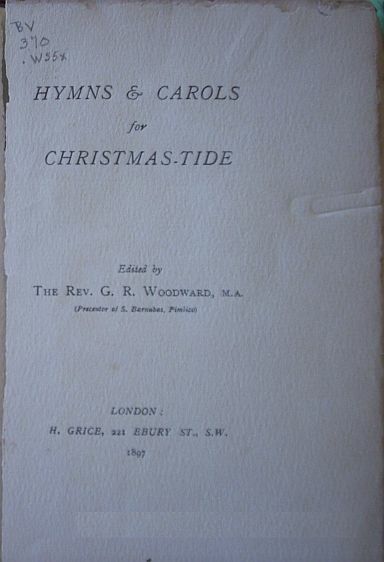 Source: G. R. Woodward, ed., The Hymns and Carols for Christmas-tide (London: H. Grice, 1897). The source was the text version; no copy of the music version seems to be available at this time. Fortunately, some of these carols appeared in other collections edited by Rev. Woodward, and from them we have music for these carols. Whether he live or he be dead. now in course of preparation. So many Carols suitable for the sacred and joyful season of our Lord's Nativity are already in the field that the appearance of yet another volume seems to call for a word of explanation. Several years ago the late Rev. T. Helmore lent the Editor his copy of the “Piæ Cantiones,” printed at Greifswald in 1582.This was the source whence he and Dr. Neale derived the lovely melodies of their “Carols for Christmas-tide” and “Carols for Easter-tide,” which collections published in 1853 and 1854, are, in the Editor's opinion, unquestionably far and away the best of all the Christmas and Easter carols that has yet appeared. It was evident, however, that the treasures of “Piæ Cantiones” were by no means exhausted; and as Dr. Neale was no longer amongst us, and as modern poets, seemingly, have a strong dislike to be fettered by the original metrics when translating from Latin or German into the English tongue, the Editor had no alternative but himself to essay translations. It seemed a pity that such beautiful words and tunes, e.g., as those of “Puer nobis nascitus” in “Piæ Cantiones” and of “Quem pastores laudavere,” in German hymners, should remain for the most part unknown to English Churchman. The words of these Carols range mostly from the 12th to the 15th centuries. They were already old at the time of the Reformation, and were naturally, and wisely, retained by Luther, and has been sung ever since in Germany by Catholics and Protestants alike. Take “Puer natus In Bethlehem” as a sample. Archbishop Trench, in his Latin Hymns, describes this Carol as “of a very beautiful simplicity, and absorbing easily and naturally much theology in its poetry, and in many ways containing much in a brief compass.” These carols, in their original language at any rate, will be found to have an indescribable charm, being so simple and naive, and yet so profound. They have a genuine Catholic ring about them, and they breathe of the old world. The Editor is aware that they will not appeal to all: but if they find their way into the hearts of some, and help in any way to emphasize the doctrine of the Incarnation of our Lord Jesus Christ and the mother Mary, and if they prove an aid to those who love to celebrate the Birthday of the Holy Child, then the Editors labor will be amply rewarded. As for the tunes, they are mostly of the same age as the words, and written in one or another of the old Church modes. Though modern musicians may understand the laws of Harmony better than their predecessors, yet our forefathers undoubtedly possessed the art of writing lovely, flowing diatonic Melodies. The writers of these Carols were the contemporaries of the men who built Durum Cathedral and Westminster Abby, who painted the windows in York Minster, and illuminated the manuscripts which we still see and admire at the British Museum. As for the rest, the Editor would pray that these Songs may prolong the birth in of the Angels Praise, Gloria in excelsis Deo, et in terra pax hominibus bonae voluntatis. Vigil of St. Andrew, 1896. The complete score of Rev. Woodward's edition of Piæ Cantiones, scanned and compiled into a PDF file, is available from the IMSLP-Petrucci Music Library: Piæ_Cantiones. Also at the IMSLP is Rev. Woodward's Cowley Carol Book. Several of these carols in this collection would appear in subsequent volumes edited by Rev. Woodward. An Italian Carol Book (London: The Faith Press, Ltd., 1920); co-edited with Charles Wood. The Cambridge Carol-Book. Being Fifty-Two Songs For Christmas, Easter, And Other Seasons. (London: Society for Promoting Christian Knowledge, 1924); co-edited with Charles Wood. Please note that content is limited to Christmas-related carols or hymns. Carols for Yule-tide (Highgate Village [West Yorkshire] : Printed by G.R. Woodward, 1922). Printed by Rev. Woodward on a printing press that he set up in his home. However, a review of WorldCat shows that few of these volumes are held in public libraries. For some volumes, there are no copies available in the United States (where I reside). It will therefore be impossible for me to incorporate these volumes, as I am not longer able to travel due to medical issues. Hopefully, someone in Great Britain will be able to review the available copy or copies (largely in the British Library), extract the lyrics and music created by Rev. Woodward, and post them on-line so that all can enjoy the fruits of his scholarship. In The Hymns and Carols of Christmas-tide there are frequent references to "Daniel." I believe that this refers to Dr. Hermann Adalbert Daniel, Thesaurus hymnologicus sive Hymnorum. Five Volumes. (Hallis: Sumptius Eduardi Anton, 1841-1856). Copies are available at both Google Books and the Internet Archive, among others.